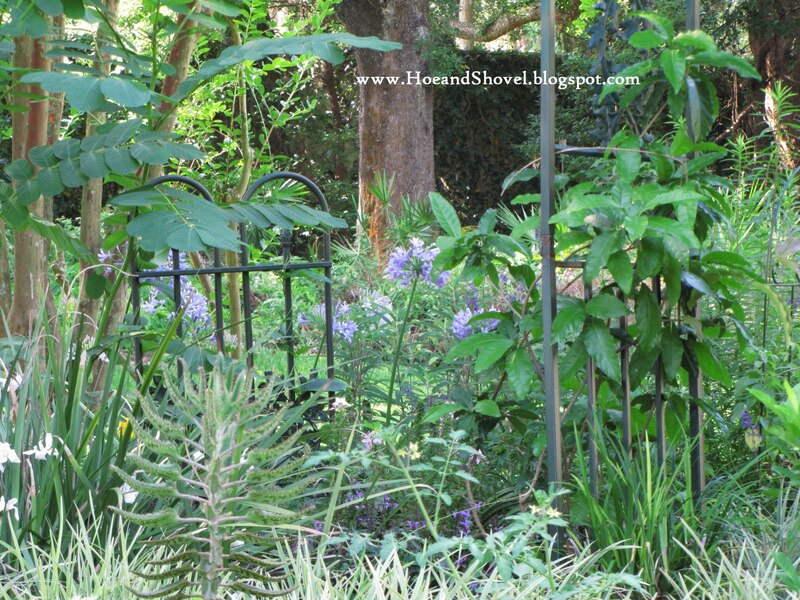 Hoe and Shovel: Can Naturalistic and Tidy Meet in the Middle? 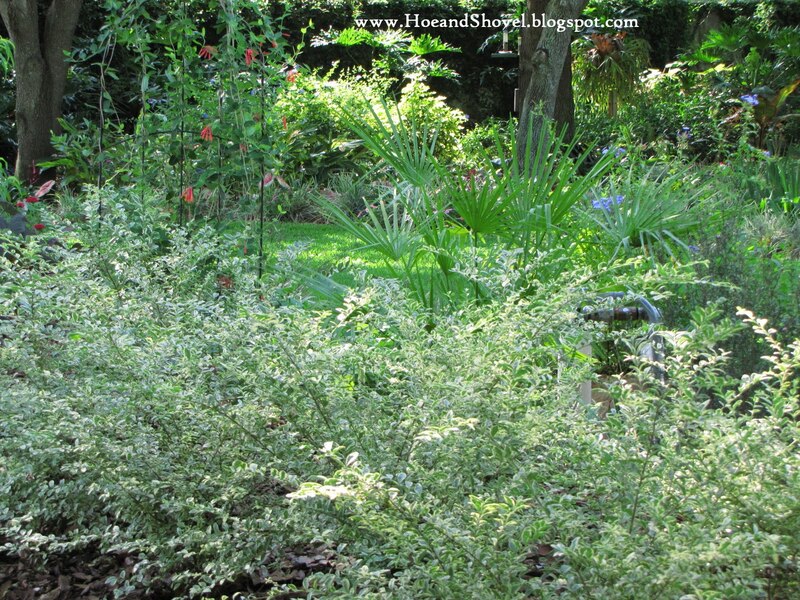 For the past several years it is reasonable to say our garden has been in a major transition. Oh. So. Gradually. 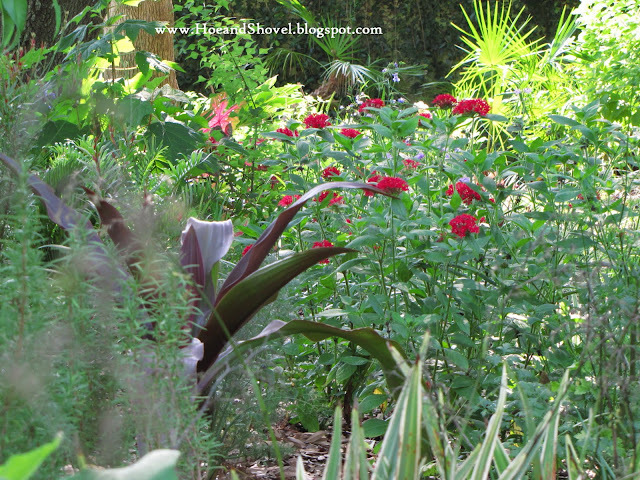 It is evolving away from the traditional Florida residential landscaping. You know the kind. One with lots of lawn grass and a perimeter of shrubs hugging the average sized ranch style home. Granted we've had large stands of oak trees all along to assist in getting us on the right track with our gardening philosophy. One that sees the ecological importance of creating a space that blends with the natural systems of our area. Now we design with not only a place we love to live in mind but also considering factors like an environmentally safe and life-supporting habitat to wildlife as well as the plants we grow. Those of you who know me recognize I have a natural bent toward organization and order. Chaos and/or disorder are not traits that work well for me. This need for tidiness inevitably spills over into my gardening style. It stands to reason that in this conversion from the typical perfectly manicured lawn and sheared hedgerows landscape to a more naturalistic setting I've still tried to maintain order. We've reduced the lawn significantly taking a little more out with each season that passes. In its place structured planting beds have been created. The approach to naturalistic for us is not willy-nilly. There are plans and purposes enlisted. It is about blending a more free-flowing type of garden with composition. After all, we don't live in the woods we are in a residential setting. In an effort to imitate nature more closely we've combined natives and Florida-Friendly plants placed in the correct place as far as what/where they require to thrive. Every choice makes consideration for what will attract and maintain wildlife and the eco-system we are blessed to nurture in our own little piece of earth. The birds, butterflies and other beneficial insects are welcomed guests as we minimize (and for the most part eliminate) the use of fertilizers and pesticides. 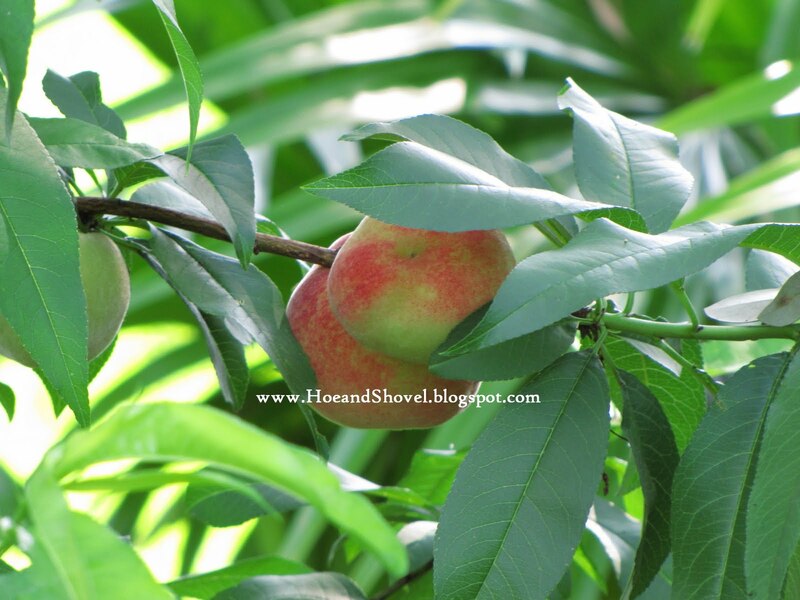 Rather than placing the peach tree on its own it is mixed right in with the shrubs and perennials into a planting bed well-amended with organics it requires. It has been underplanted with Agapanthus and Guara and Rosemary resting nearby. Each planting bed is chocked full of plants designed to blend together in a cohesive way but without looking like carefully placed nursery stock. Even though every plant is carefully chosen and carefully placed. 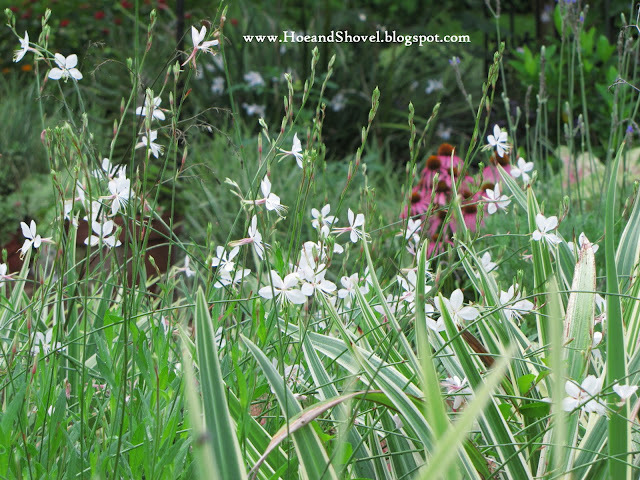 One of the ways tidy has given way to naturalistic is in allowing some plants to sprawl over the borders. But, still, there are borders to delineate spaces which leans toward tidy. With the use of a large variety of textures, foliage colors from light to dark in every appealing hue, varying heights, clambering vines, and leaf sizes from tiny to enormous the transition has been a labor of love and sheer joy of creativity. Making the most of these elements eases us into the naturalistic appeal we desire to acheive but doesn't forsake the need for tidy. I guess what it comes down to is that we aren't completely naturalistic and we aren't completely tidy. And, of course, we aren't completely finished. 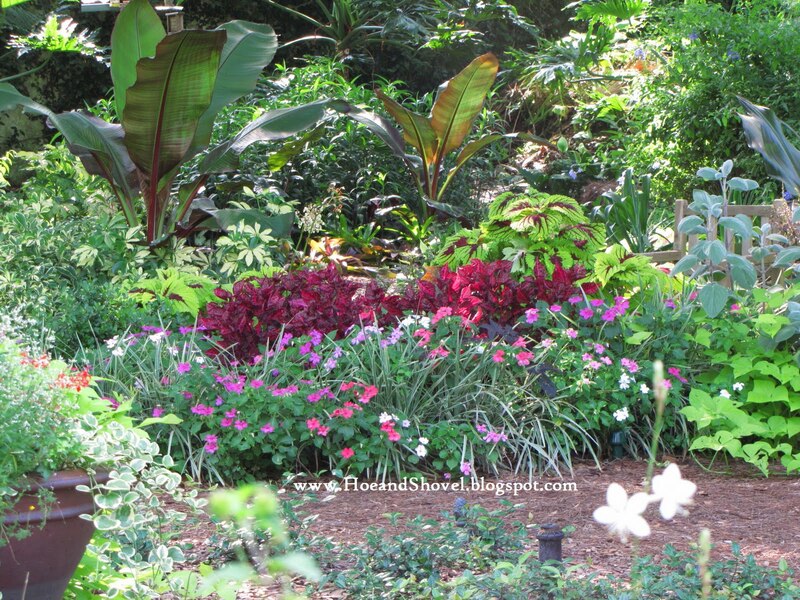 We haven't given up our tropical plants, we just mix them right in with natives in areas where they don't require any more attention than the rest of the plants chosen for ease of maintenance. We aren't totally dependent on them so when they freeze back in winter, as has been the case the past two years, it isn't total devastation nor the end of the garden. The natives are becoming the backbone and the tropicals are the accessories. It's a garden in progress. There are many more ideas swirling around but we feel we've found our happy place where naturalistic meets tidy. Your gardens have changed quite a bit just since I've been reading your blog. They only seem to get better with every passing season. You are a smart gardener...one can learn a lot from you. I'd say it's a combination that certainly works well in your garden. Everything looks so beautiful. And I LOVE that blue bird bath! Having been a 'willy-nilly' gardener myself, I have appreciated the sense of design present in your gardens. 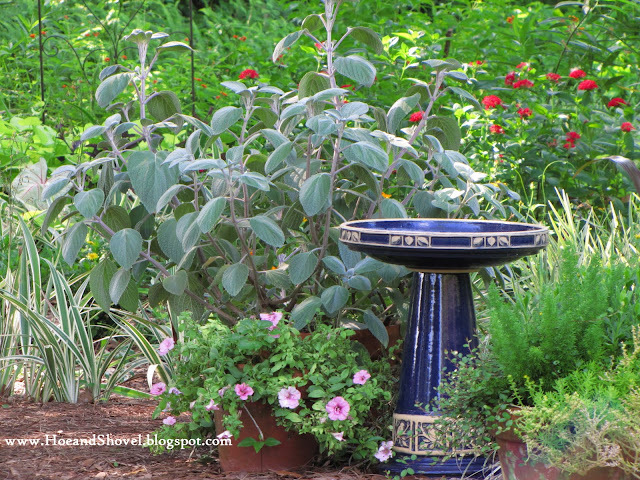 I have learned a lot about being more purposeful in my planting from your blog. The pictures you share in this post are just beautiful. I think you've mastered "tidy/natural". I just love what you said: "I guess what it comes down to is that we aren't completely naturalistic and we aren't completely tidy. And, of course, we aren't completely finished." I had to laugh out loud. I've finally accepted that my garden will always be a work in progress. i have loved seeing the evolution of your garden into this very thing...tidy meets naturalistic. what a great combination. i know it is a change on the inside of you as well...which for your very whimsical sister has been such a great place to connect. i love it! every bit of it and it just keeps getting more spectacular. now if i could just pick up more of the planning side from you...lol. There is so much beauty in natural garden even when if it becomes untidy in our eyes. Many can't see it but we can quickly pulled back into shape. I compare it to a shower and clean clothing or a shave and a fresh haircut. Makes a world of difference. I start with chaos with disorder my second name, the end results are quite pleasing most of the time. I agree to plant with a purpose and a mental picture of what the end results should look like. I am still working on getting mine to a state where I can sit back, relax and enjoy it. Wishful thinking perhaps? Meems: I think you are well on the target to have Naturalistic and Tidy meet in the middle! I always loved how your garden looked and evolved. 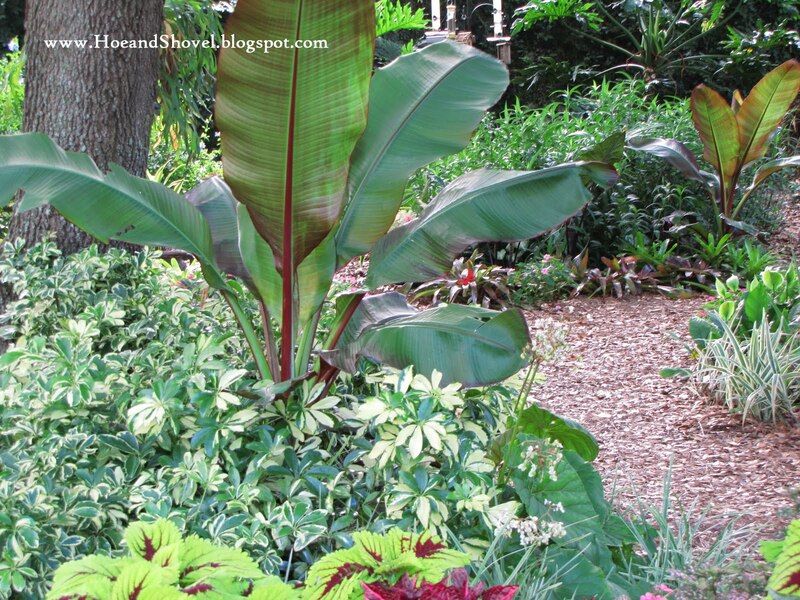 Mixing tropicals with the natives is a great idea, so that we won't see too much of brown after the winter we just had. I have a very small garden compare to yours, and still have some areas that have not opened yet. So I think the careful design and planning is even more important here. Thanks for always being a great inspiration for me! Meems, I like your description of the two styles meeting. 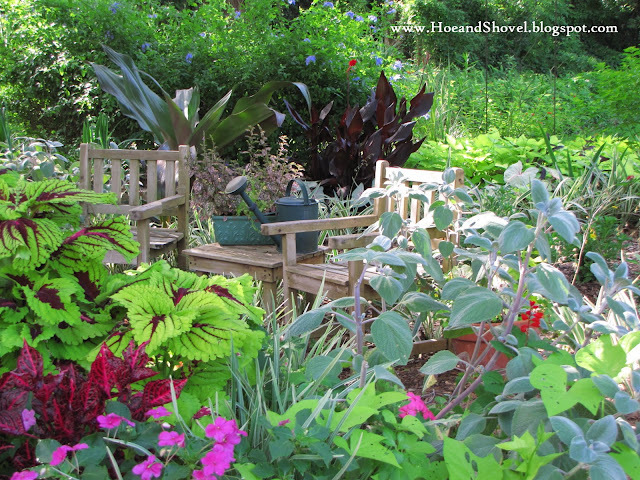 It's my favorite kind of garden...natural, but not too natural; and tidy but not too tidy. It's a fine balancing act that you perform beautifully!!! I could spend all day in your garden and never tire of it!! It looks like you've found "your" gardening style and ran with it. And, when a garden is created from the heart...one with your own personal style...it will be beautiful (as yours is), and will be a joy to others who are fortunate to live next to or pass by. 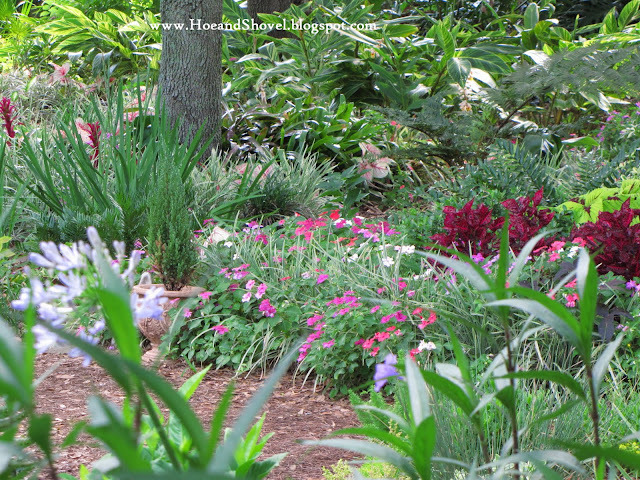 Your garden is definitely a gift to you and your family, and to others as well. I keep forgetting to mention that I like your new header photo of your circle garden. It looks like it's shaping up nicely. Everytime I look at your blog; I fall in love with your garden all over again. I have a much smaller space as we live smack in the middle of a residentual neighborhood with neighbors who have a row of plants against the foundation, lots of grass and perhaps some annuals about. That is not my style. I have eaten up much of our front lawn with my garden. I LOVE the idea of ordered chaos in my garden. I see the plants spilling over one another and enjoy the beauty of the colors all merging together into one great garden. I love Monet's paintings and that is my type of garden, which would be much easier with more space and the climate in England :)...but, yo work with what you have. Your garden is marvelous...all our gardens are a work in progress..that is where the thrill lies! I hadn't thought about how challenging it can be for a gardener used to order and neatness to adapt to the slightly anarchic form of naturalistic gardening. It gets even more fun when the plants start moving around the garden, making their own associations and creating their own rhythms. It's easier to let them do it, than to try to keep them where you put them. Letting nature take control with you as the judicious editor is a balancing act. It's going to be a fun ride. I love hearing how other gardeners attempt the same thing I'm trying to do - I love cottage garden plants but not the chaos. My plant palette is very different from yours, but I want tidy without being too formal and stiff. It's a long process, as you say! Oh, is it ever a fun ride! I love to walk my little garden every day and see what new babies are coming up on their own. Many annuals and semi-perenials self-sow, and although it may not be where I would plant them, it is always a joy to see how nature decides to step in and take over. Right now, I have a cleome just starting to bloom. It came up from seed right in the middle of my rosemary. I saw it when it was just a baby but did not have the heart to remove it knowing it would share its' beautiful blooms with us for a season and then spread those precious seeds around the garden for next summer! I am glad I made it to your blog to see this post. You did a great job expressing your thoughts! I love that statement, "I guess what it comes down to is that we aren't completely naturalistic and we aren't completely tidy. And, of course, we aren't completely finished." 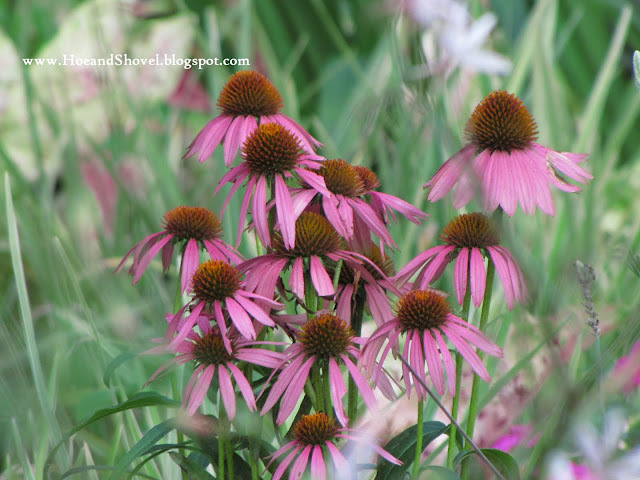 I mix natives, non-invasive non-natives, herbs, annuals, perennials, and biennials together. Sometimes things get a little crowded, while the ground shows in other spots, which bugs me. I have trouble with order, but like for plants to have the space they need to grow. I go around tying string around the bottom stems of sprawling plants like cat mint and yarrow, and trim them back so they don't take up more space than I want them to have. This year, as I've been doing that, I've been saying to myself, that I am creating some control in the chaos. Like you, I like to share the space with wildlife, since the outdoors is their home, but I'm having problems with rabbits eating more than I really want to share with them this year. I have sprayed some Liquid Fence, which is not helping much. I'm noticing now, that some of the plants they ate all but the stems of are starting to come back, so maybe I shouldn't panic so much. I don't think I'm going to get a pea harvest, though. It looks like you are enjoying your garden. It's beatiful! Hi Meems~~ I've grappled with this issue too. Although I have serious spacing issues, that I can get away with a lot if I've got well-defined borders and maneuverable pathways. I ALWAYS enjoy your garden photos. Your love of plants is evident and you've got such a gift for placement. I love the variety of plants in your garden. They are beautiful. You have a wonderful philosophy for gardening. Everything is so beautiful in your garden. I like the changes that you've shared over the last few years. Dear Meems, Your garden is absolutely enchanting - beautiful colour combinations, well and carefully grown plants, groupings bold enough to make statements, and, of course, thoughtfully planned. Like you, I err on the side of tidiness in the garden. The balance to be aimed for is always one of controlled, romantic disorder achieved, in my belief, through strong, formal structures against which can be placed informal, but not random, plantings. Your garden suggests all of this and more and you are clearly making good use of a woodland within a residential setting. And, Meems, thank you so much for the very kind and thoughtful message left on my recent 'Explanatory Note'. I do so appreciate your concern and through this I have found you. It takes a lot of observing nature to figure out how the permaculture of a area works. You are well ahead of most of us in that regard. I think the end goal is to find a balance that works with nature yet still lets you express your individuality. Learning from each other is what makes blogging so interesting. Thank you. I'm a little wacky myself for any blue glazed pottery in the garden. Your kind words always warm my heart. I'm quite sure, however, I haven't mastered anything except a love for plants and designing with them. 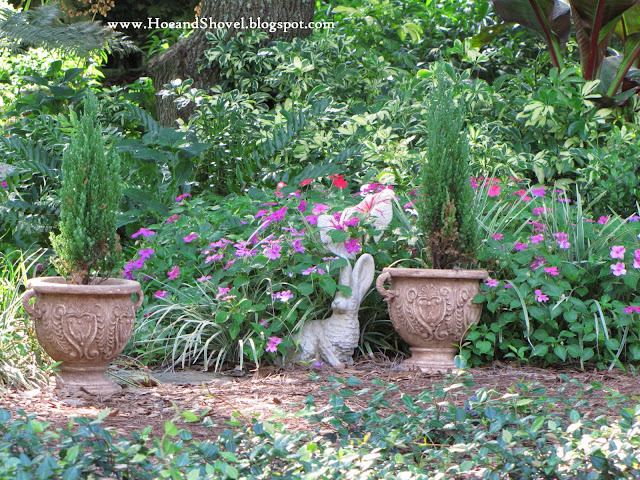 What fun would lie ahead if we ever finished our gardens? It's never going to happen. A small garden gives you a wonderful chance to design some really fabulous places. The advantage is the design elements can be pulled together with ease. You are doing a great job with this adding the things you love and thinking thoroughly about your choices. I can imagine your beautiful space all crammed with color and texture! It is lovely I'm sure. Thanks for your kind words. Your garden has come a long way. I think you know what you want and you will get there with some patience. My hat is off to you for all you accomplish with little ones still needing so much of your attention. You are funny. I like your carefree style. It helps me not take myself too seriously. I guess there are levels of naturalistic. I have a tomato plant growing in the shade of the salvia madrensis ... at first I started to yank it. Then I just let it be. It is producing tomatoes with no help from me. That's pretty naturalistic. I'm glad you made it by also. Thanks for stopping. I'm having trouble with armadillos and grasshoppers. The armadillos dig up plants as they forage around the roots for worms and grubs. The grasshoppers are just making a mess as they devour tender foliage and leave it tattered and torn. I'm quite grateful I don't have to deal with rabbits, too. And it is your well-defined borders and very appealing pathways I adore! You've got it figured out. You are sweet to say so. Thanks. YOU are a masterful gardener. Even though I'm working with a bit more natural elements I learn a lot from you with all the organization you put into your garden. Your words are taken to heart. I'm always striving for that balance you described so well. So perfectly stated! Thank you. Meems, it's been way too long since I've visited your garden, both virtually and in real life. But I can say that your combos WORK. They are heavenly to walk through! I can't wait to see you again in Buffalo!! All the scenes are just picture perfect. What an amazing eye you have.